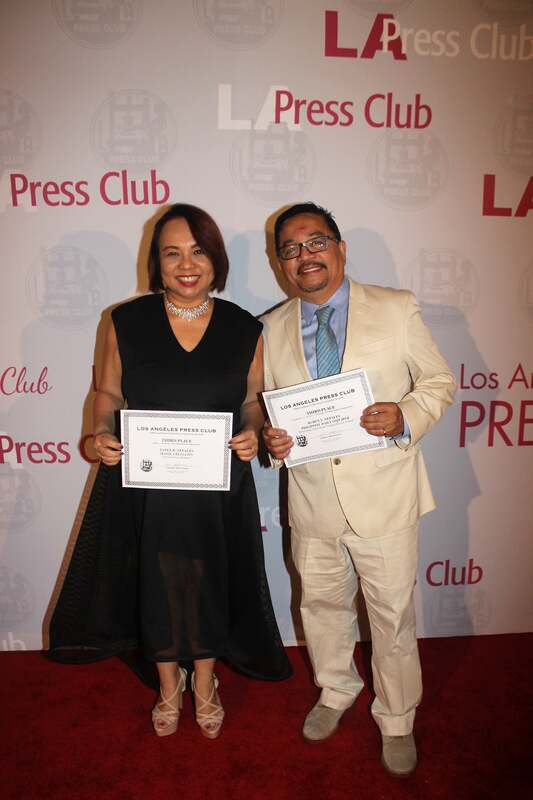 HFPA members Janet Nepales and Ruben Nepales, recipients of 59th Southern California Journalism Awards. Three members of the Hollywood Foreign Press Association were recognized for their achievements at the 59th Southern California Journalism Awards at the Biltmore Hotel in Downtown Los Angeles Sunday night. Adam Tanswell won second place in the Entertainment News or Feature category for his story The X-Files Reborn. Additionally, Tanswell scored a third place for his personality profile titled David Duchovny: We Both Went a Little Nuts. In the news category Janet Nepales took home third place with A Proud Pinoy Moment. Another third place went to Ruben Nepales in the columnist or critic category for Mel Gibson Talks about Turning his Life Around. Though journalism is facing challenging times, a record number of 1,200 entries were submitted, announced Robert Kovacik, President of the Los Angeles Press Club. All submissions were judged by sister press clubs including the National Press Club in Washington, Florida Press Club, Lone Star Press Club, Press Club of West Pennsylvania and Cleveland Press Club. Jeff Balou, President of National Press Club, also addressed, to an industry-filled room, the current atmosphere inside the Washington Beltway with regards to attacks on America’s press corps. Last year more than 100 journalists were killed in the line of duty around the world. Pulitzer Prize Winner Daniel Berehulak accepted the Daniel Pearl Award for Courage and Integrity in Journalism. Mr. Berehulak covered the Philippines’ bloody drug war under the regime of Rodrigo Duterte which, according to Mr. Berehulak , has already killed at least 9,000 people. Movie mogul Harvey Weinstein and rapper Shawn Jay Z Carter were the first recipients of the new Truthteller Award. The duo teamed up for the documentary series TIME: The Kalief Browder Story. In his video message Harvey Weinstein addressed his fight against racial discrimination and injustice in the US Criminal Justice System. Their next collaboration will take up on the Trevon Martin case.